Indian skipper Virat Kohli today lauded his bowlers for their lion-hearted effort on a flat track against Bangladesh in the one-off Test. After an emphatic win against Bangladesh in the one-off Test here, Indian skipper Virat Kohli today lauded his bowlers for their lion-hearted effort on a flat track against visitors. 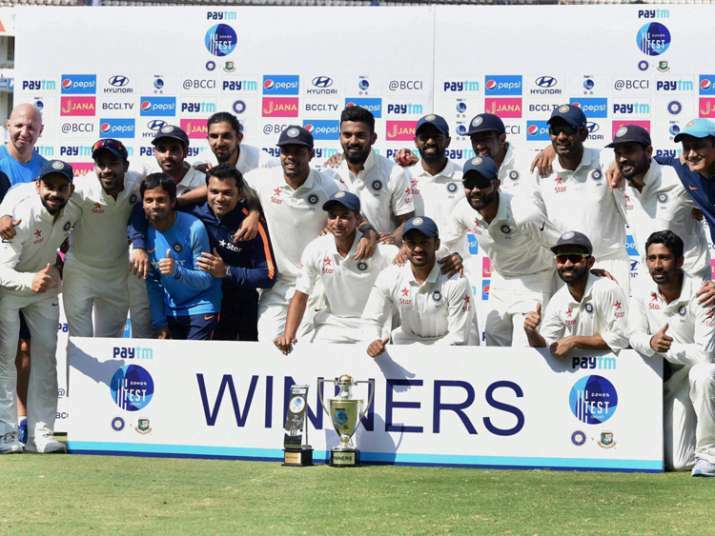 India defeated Bangladesh by 208 runs in the one-off Test which lasted five days, beating expectations of an early finish owing to the visitors' minnow status. The win also took India's unbeaten streak to 19 Tests. Kohli, who believes in the old adage that a captain is only as good as his team, said, “I look to push myself, throw myself around in the field so that other guys know that they also have to push for a wicket." Asked how much has he improved over the 19 Tests that he has captained, Kohli said: "Honestly it is the players that make you the captain that you become. To be very honest, anyone knows how to set fields in the ground, it's just that you have to make sure that you take up the responsibility of keeping the energy of the team up." "The bowlers know what they need to do but the fielders within the ring need to support the bowlers. I need to do that first, for the guys to show that energy. I have been able to maintain that and that has been a takeaway from the games that I have been captain so far. Lot of times, you know that there is only so much that you can do as a captain," Kohli said in the post-match press conference. Kohli seemed satisfied with the performance of his fast bowlers. "Very good. Credit to our bowlers, they were able to get result on this kind of a track. Considering that the wicket was very good to bat on, it took a bit of patience for us to get wickets during Bangladesh first innings. I thought Umesh (Yadav), Bhuvi (Bhuvneshwar Kumar) and Ishant Sharma were brilliant in the first innings but Umesh stood out," he said. "In the second innings, all three bowled really well but Ishant stood out. I have said in the post-match that quality of our spinners allows our fast bowlers to attack because of the way spinners bowl and contain runs, the pacers can really attack as soon as it starts reverse swinging,” the captain said. "I thought today Ishant's spell was really good, he bowled with pace and had to put in effort to take wickets at that stage and he took both the set batsmen out. That was really good for us," he added. Talking about his 19-match unbeaten streak as a captain, Kohli said: "I don't think it's because of me. I mean everyone at the international level wants to do well. "We are playing as a team and that's been the difference in this team, if you see, you can say probably 2016, I scored a lot of runs but before that in 2015 as well, we won a lot of matches. I didn't score many runs but the other guys stepped up and scored runs,” the second rank Test batsman said. "Ajinkya's two tons in Delhi (vs South Africa) and second innings hundred in Sri Lanka, so there are quite a few instances, where all the members of the team have stepped up at some stage or the other. And that's why we stand where we are and having that streak is not down to 2-3 people, it is a combined effort of all the guys."